and so I make a point of asking you to pray. Last night, a mom came to Tenwek. For reasons that are unknown, but that I'm certain are horrific and yet horrifically insufficient to justify her actions, she drank a pesticide in an attempt to end her life. She also gave the same to her three children. One has died. One is on a mechanical ventilator in the ICU. The last is on the brink of also needing a ventilator to continue breathing. Mom herself is also in the ICU, but doing better than the children. So, the best case scenario is that she and her two kids survive, without impairment, and she has to live with the knowledge that she has killed her child. We are in need of redemption that we do not have the resources to provide. So, we look outside ourselves. We pray. We got the idea for this blog from our friends in Ecuador, the Benedicks. 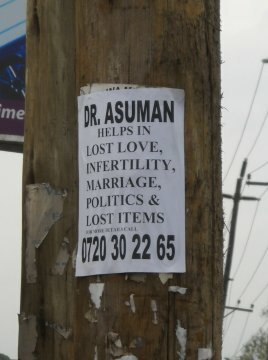 Sometimes people are amazed at what is and is not available for us here in Kenya. 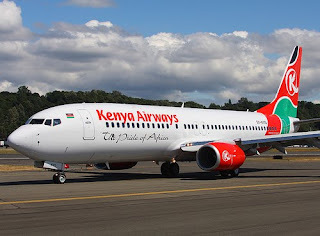 We are fortunate to have Nairobi so close by, because there really is a lot that we can get in country. And even just over the past 10-12 months we've noticed a lot more showing up on the grocery store shelves. We do the bulk of our shopping at a place called Nakumatt. So, for this post we'd like to hold a little contest. We'll list off 15 items and you tell us which ones you think ARE and which are NOT available (hint: 7 are and 8 are not). Then we'll post what's available and have you guess how much things cost. Post your guesses in the comment section, and we'll post the answers next week some time. A future post will feature stuff from our local store "Toyworld!" Year by year, I grow more to love that Christianity expresses the paradoxes that are the reality of our lives. These are the impressive truths of our faith. That mankind is cruel and magnificent. That life is incredibly simple and hopelessly complex. That the world is dying all around, yet being renewed day by day. It may be part of the nature of things here that this last observation is exemplified. Many are the days when, at my utmost optimism without abandoning realism, I can only say with Paul Tillich that goodness and newness are peeking through “here and there”. It does take a certain set of eyes to see even that much, but I believe that agreement with this can be found more or less empirically. It's a humble acknowledgment, and beautiful in its honesty and humility. And yet the promises of Jesus loom large. They would be embarrassing if they weren't so utterly lovely. “I am making all things new,” he says. All things? Not just “here and there” and “now and then”? The deep joy this fosters rings true, but it also forces me to reckon with the worst tragedies. I won't rehash the details here, but you know the stories. You are making this new? Here? And so we live in expectation. Maybe even paradox. But if the story of the bible – it's depiction of God's character, it's worldview, it's overarching redemptive story – is to be believed, then it may be true. Maybe even this can be reconciled. Think of Abraham. God delivers an embarrassingly large promise. Leave your home. Go to the place I will show you. Your descendents will be like the stars in the sky. Abraham goes. And he dies in a foreign land with one promised son, his only inheritance a cave to bury his wife, for which he was charged an extortionate fee. Did the promises fail? No. And yet, though Abraham looked forward to their fulfillment, he didn't see it. But we have. We have seen it come to pass, and it is marvelous in our eyes. All peoples are blessed. His descendents are without number. And thus was the New Creation always present, everywhere, but peeking through to our eyes, only now and then. Hope requires faith, but it need not be unfounded. For if it was true of the promises to Abraham, then maybe it is true now, in some way that can be looked forward to, but not yet seen, for now only popping up now and then, through some brief rent in the curtain. So, may our eyes be blessed, that we might see the New Creation, here and there, now and then. And may our hearts be blessed with faith that we might believe, through these small glimpses, in an ever-present reality of Jesus our Savior making all things new. What a great and insightful trip Heather and I had to Madagascar. We are grateful for smooth logistics, for meetings with key people, and for thoughtful and wise people there with whom we could explore the possibilities. Madagascar is a country of great beauty and rich diversity. For example, Madagascar is home to half of the 150 species of chameleons worldwide – one of which is 2 feet long – Anna would love living there. Yet Madagascar is a country of desperate poverty as well, with 70% of its people living on less than $1 per day. As you can see, Abi could easily pass for a Malagasy child. Our contacts there were through Africa Inland Mission, which is the organization we would partner with if we went there. We were very impressed with their intentional vision, thoughtful planning, and well-designed strategy. We spent two days in the capital, Antananarivo, meeting with missionaries and touring the area and its medical facilities. Then we took a short flight up to Mahajanga, instead of the 11 hour drive. 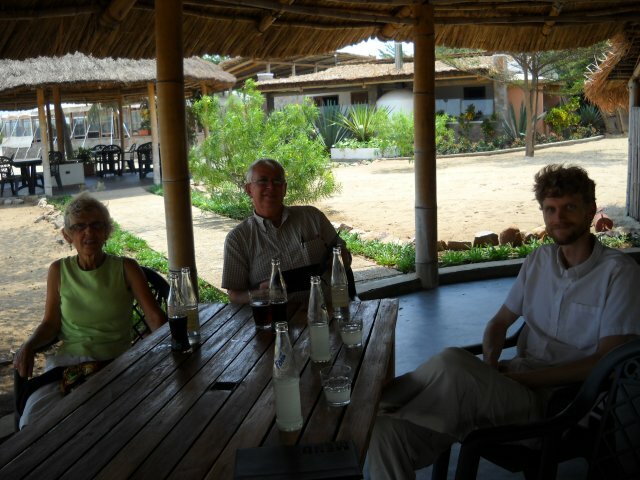 Mahajanga is a small city on the coast with very warm temperatures and very beautiful beaches. With the help of missionaries in Mahajanga, we explored the possibility of working and teaching in a 360-bed hospital which is run by the government. This hospital is one of the primary training sites for over 300 eager medical students and about 75 interns who study at the University of Mahajanga, but they have a shortage of teaching physicians. We were warmly invited by the administration of the university to come and work and teach. The language situation is a bit daunting. First we would need to learn French (which we would use primarily with colleagues and students in the hospital and medical school). Then we would also need to learn to speak Malagasy (which would be used to talk with patients and everyone else). That could require a year in France, and maybe another 8 months of dedicated language time in Madagascar before starting work. Overall, Madagascar is a place of great potential where we could be involved in wholistic medical work and significant teaching. It seems that there is a rising tide of development interest in Mahajanga, and it would be exciting to be a part of that momentum. So it looks like it will be a tough decision to decide which country we will go to. Hopefully God will call others to work at these other sites. The harvest is plentiful, but the workers are few. Mzee (Swahili for respected, old man) was a sharp-looking gentleman with a hop in his step and a twinkle in his eyes. He had come to Tenwek Eye Unit with poor vision and had received sight-restoring cataract surgeries. He was quite happy with his new eyes. Now he had just one problem that was keeping him down. His right ear was looking mighty fine by Kipsigis design, but the left had become the village joke. He told me that a couple of years prior he had gotten an itch on his left earlobe. It grew thin and then fell off at one end. He desperately wanted to get it fixed. His voice lowered, "I can't tell you how impressed my wife would be if I came home with my earlobe intact and my honor restored." It had been tucked up over his ear for the past years like a dog running with its tail between its legs. She was going to be ecstatic. How could anyone refuse this poor guy, a Kipsigis elder with a dangling earlobe? It wasn't a difficult surgery by any stretch of the imagination, even for an ophthalmologist. I decided to take a bit of lobe from either margin just in case he had any occult skin cancer causing his original erosion. He needed a good inch or so trimmed off anyways in order to make his lobe symmetric with the other side, so it was a win, win situation. I hate to say it, but this guy might have been more happy about his earlobe getting fixed than getting his vision restored in both eyes! Back in the day, ophthalmology (eye) and ENT (ear, nose and throat) used to be the same sub-specialty of surgery, EENT, so here's a toast to the glory days of yesteryear. Really makes the assistance we're trying to give look pretty trivial, doesn't it? We finally had time as the McCropders to sit down last night and discuss our recent trips, so now we can feel free to share them with all our you! Eric and I will write about our time in Burundi, and then Heather and Jason will post in the next few days about Madagascar. Liberia is still on the table too, and the Cropseys are still planning to visit next month. As mentioned before, Burundi is a small country southwest of Kenya, sandwiched between Tanzania, the DRC, and Rwanda. It has suffered through the same ethnic/tribal conflicts as Rwanda over the past 20 or so years, with civil wars being fought between the Hutu (majority group) and Tutsi (ruling group) people, and peace has only been present now for about 6 years. The good news is that people are very optimistic about peace. We heard from many many people that Burundians are tired of war. One man wisely said that although we cannot predict the future, the attitude of Burundi seems to be that now is the time to build, and invest, and move forward. We saw lots of evidence of that in our 5 day visit. Burundi is a really beautiful country, and is similar to the Kenyan landscape (at least the part by Tenwek) in a lot of ways. Lots of hills, a scattering of trees, green. It was the end of the dry season when we visited, so lots of haze and brown, but we got a good idea of how it will look after the rain. We stayed mostly in Bujumbura, the capitol city of 1 million people, crowded but much less "cosmopolitan" than Nairobi. Things would probably be harder to come by in terms of western comforts, but we were pleasantly surprised by the availability of some things, including Hershey's syrup, Pampers, Cheerios, and Mountain Dew! 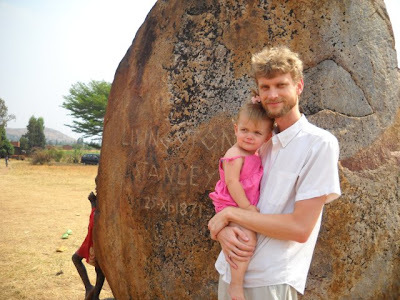 Burundi's one tourist attraction--a rock marking the possible site of the famous Livingstone/Stanley meeting. As in, "Dr. Livingstone, I presume?" Our contact in Burundi is a man named Bishop Elie Buconyori. 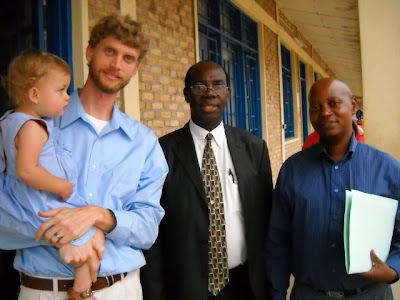 He's the head of the Free Methodist Church in Burundi, and spent a number of years in Kenya and the US getting training (although is is originally from the central part of Burundi). 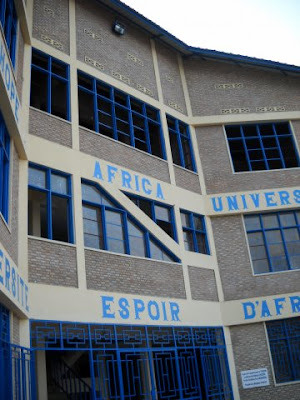 He's now the head of a school called Hope Africa University, which initially started in Kenya about 10 years ago, but moved to Burundi in 2004 as the war was ending. It's a Christian university which is highly respected in the country, offering lots of different programs, from business and theology to nursing and education. In 2005 the newly elected president of Burundi (also a Christian) asked HAU and the bishop to consider starting a medical school at HAU. 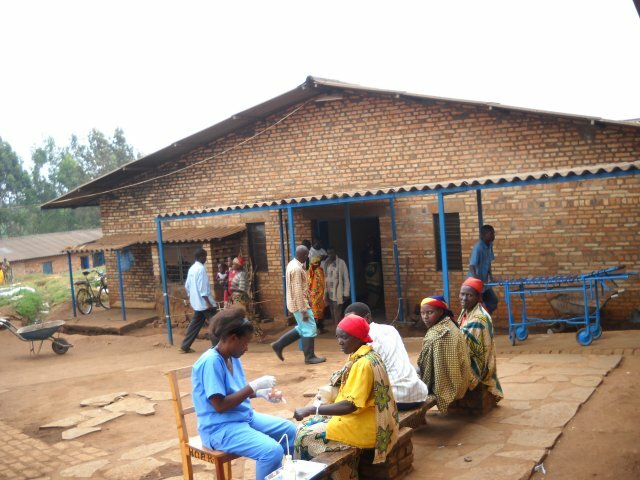 There are 2 other med schools in the country, the University of Burundi (which accepts 300 students/yr and graduated around 30, yikes!) and a small school in the north that no one seemed to know much about. But for a country of 8 million, there just aren't nearly enough doctors currently, and not nearly enough getting trained. Despite minimal resources, HAU decided to accept the president's request. This year, the first accepted class is starting their 5th year of training. Med school is a 7 yr prospect. Students are accepted right after high school and the first 4 yrs are classroom based learning in the general/biological/health sciences. Then years 5-7 are more clinical in nature, hopefully more clinic and hospital based. The problem is that there aren't really any doctors available to do the clinical (and in our opinion, most important) part of the training. Thus far, students have been rotating though the University hospital in town, although it's not their "home turf." Even the university hospital, the "premiere" hospital in the country, has very limited resources, not enough staff, and patients sometimes wait for months to get appropriate treatment. Bishop Elie's vision is for HAU to do their 3 years of clinical training at their own hospital site, a mission hospital named Kibuye, approximately 2 hours from Bujumbura, the capitol. On Wednesday of our trip, we visited Kibuye. It was started 50+ yrs ago as a missions hospital by the Free Methodists. It's still technically a mission hospital, although no "white folks" have been working there for awhile. There is space for about 90 patients in the hospital, although while we were visiting about 120 were squeezed into those beds, and there is only one full time doc working there (a Burundian generalist). There are also about 120 people seen in the outpatient clinic every day by nursing staff. Initially the thought was that this hospital would not be big enough for our team of 4-6 doctors. 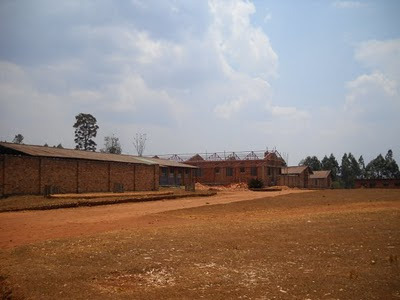 However, Bishop Elie plans to turn Kibuye into the primary teaching site for HAU, and to do this he has plans to expand the hospital to 250 beds. There is already a 30 bed maternity building halfway finished, and plans in the works to build 2 more patient wards and start an eye program. He told us multiple times during our visit that the only thing they need now is doctors to staff the hospital and teach the students! It's hard not to get caught up in the excitement of the Bishop, and it really does look like a good option in a lot of ways. The Faders are equally excited about Madagascar, although the opportunity there would look quite different. Pray that we will have discernment to find our way, and that if not us, God would be raising up others to join His work in Burundi! 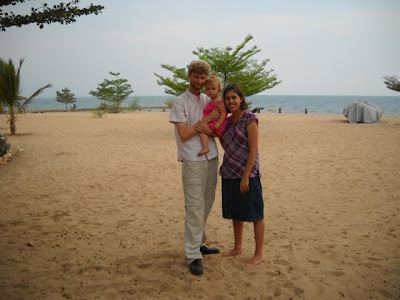 On the shore of (crocodile and hippo infested) Lake Tanganyika! The Popps left private practice in the US and will help out the OB department here at Tenwek significantly. Anna and Leo will be enjoying the benefits of home schooling for the first time. Of course, for the next few days they will mainly be getting over jet lag and figuring out exactly how much that first grocery trip in Nairobi actually cost... Check out their blog here. The McCropders have all reunited at Tenwek after successful scouting trips to Burundi and Madagascar. Both the McLaughlins and the Faders had fruitful investigations of hospitals with good potential for future McCropder involvement. 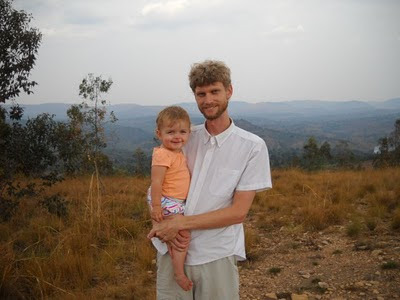 The McLaughlins and Faders will soon write posts about their discoveries and adventures, just as soon as we recover from travel-with-a-toddler fatigue. The summary is that we seem to have two good options before us. We are happy to be home. This picture was taken today as we gathered to celebrate the one-year anniversary of the day Abi came home to the Fader household. We feel very blessed today. Blessed to have adopted Abi, blessed to have had an excellent trip to Madagascar, and blessed to come back to such a wonderful group of friends here in Kenya. Scouting season has officially started for the McCropders. 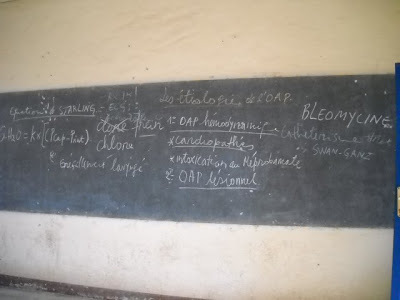 I am writing this from Madagascar, where Heather and I are exploring an opportunity to work with a medical school in Mahajanga, which is on the northwest part of the island. We have had a very busy and fulfilling time thus far and we are amazed by the potential for training here. The McLaughlins are leaving tomorrow for Burundi. There is a medical school in Bugumbura, which they are investigating. We all look forward to returning to Tenwek on Sunday and talking with each other about these places. Cropseys are busy back at Tenwek holding down the fort, and also taking care of Anna. It wasn't feasible for her to come here with us, but I'm sure she and Elise are enjoying slumber parties every night. We are praying for open minds and discerning hearts during these trips to know where would be the best place for us to go after our time at Tenwek.